I was strolling through TJMaxx on Sunday, looking for a specific size of mirror. Actually there were several of them in the clearance aisle. And it reminded me of a very sad fiscal time in my life; living in a huge house that I felt needed to be decorated. I needed to fill all the empty nooks and crannies. No one tells you that when you buy the monstrous house, about the extra cost of furniture and decorations goes with it. I was moving from a 3/2 to a 5/6. I was suffering under a mountain of debt and marital sadness. Most weekends I was alone. My ex was either traveling, fishing, hunting or watching Nascar in EVERY SINGLE ROOM. I realised that only a few guests came and it was how I dreamed it could be-having wonderful company, pampering them in the guest room. But I don’t remember my ex taking part. He was either gone, or hiding in his hobby/gaming room. When the ex in-laws did come, they brought an RV and stayed in it. Nobody saw that little $4.99 bluebird. Except me. I think the bird reappeared around the time I lost all this “stuff”. A painful reminder of spending $ on little bits of crap rather than saving $ to better prepare for a rainy day. For a divorce that would cost me well over $50,000 in the end-and I got out cheap comparatively. I told this story to a dear friend one day when we went shopping at thrift stores. 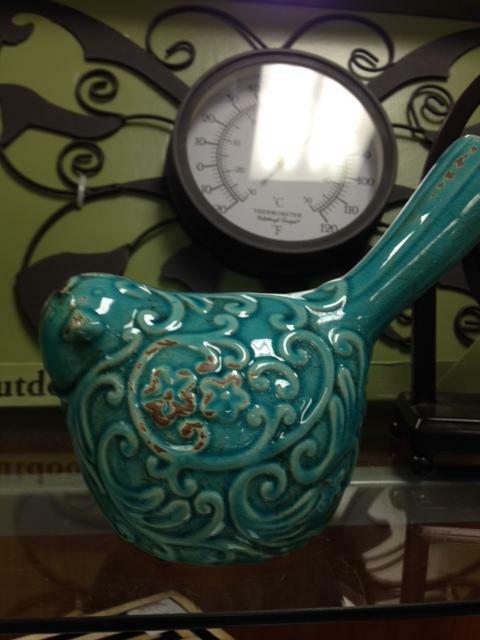 It became a way to measure purchasing items: “Do you really LOVE that or is it a ‘ceramic bluebird'”? “You’re right!”, she would say, and then laugh and put something back. She would use it back on me. So now, when I roam these kind of “second buyer” stores like TJMaxx, I look for something specific and move my cart quickly past the ceramic bluebirds. to find out more aand more.